Get more realistic forecasts for your business with this easy-to-use formula. Are you doing a sales forecast? Projections that draw good-looking curves are better than straight lines. That's because sales are the result of human behavior, and human behavior is a natural phenomenon. Natural phenomena come much more often in sweeping curves than in straight lines. Look at the spiral of a snail's shell, or the curve of a giraffe's neck. Rarely in nature will you see straight lines. And that's true in the world of commerce. Business phenomena—sales, users, growth and such—are natural phenomena. Cycles sweep up and curve over in big S curves or bell curves, graceful waves—not straight lines. One important trick in forecasting (and I mean real, practical, business forecasting) is finding the built-in curves inside the straight lines. And with one simple mathematical formula, plus some creative thinking, you can do that for your own forecasts. Take the example shown here, a collection of line charts, from real data for a SaaS (software as a service) app a few months after launch. 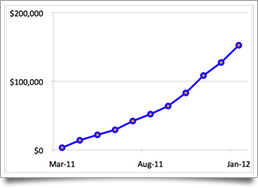 In the first chart, the blue line represents sales, which went sweeping up as the product launched. There's a nice curve there, reminiscent of the famous bell curve of diffusion of innovation. 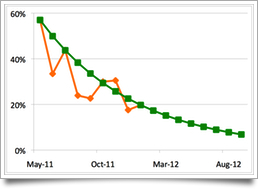 Then I plotted the month-to-month growth rate, not the actual sales, but the month-to-month growth. You can see that in the orange line in the second chart here. That's natural, too. It's easy to grow at high rates from a small base, but as the base grows, the rate of growth slows. It happens all the time. Which results in a growth rate declining at 12 percent per month. This isn't a straight decline, it's a slowing of the rate of growth. The third line chart here starts with 57 percent growth and drops that growth rate by 12 percent per month for eight months, ending up at 20 percent. So that gives me the underlying formula for the natural decline, which I can then project forward to create a forecast. I hope the visual in the third chart, with the underlying growth phenomenon extended, show you the point of the exercise. To finish the actual curve with a future projection, I use a spreadsheet to apply the projected growth rates to existing numbers. 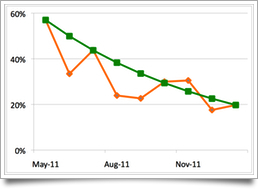 Take the most recent month's sales and increase it by the growth rate plotted on the green line. Obviously there is no guarantee that this gradual curve is better than a straight line. But does the gradual curve feel like it's more useful than an arbitrary straight line? One final thought: Don't expect to accurately predict the future very often. Forecasting isn't about guessing right, but rather about teasing apart the assumptions so you can track results. What forecasting tools do you use for your small business?